The Gallop is 13 miles and includes 765m of ascent. From Staveley Mill Yard, turn right along Back Lane and right onto Kentmere valley road, past the weir to Scroggs Bridge. Continue left along Brow Foot Lane (signed) to Brow Foot Farm. Take the path right to the river then Ullthwaite bridge, left onto Croft Head then straight on up the track, crossing the ford and on to Meadowplatts plantation. Cross over, then join the bridleway from the left, go by the stepping stones, right through the gate to Checkpoint 1. On leaving the checkpoint follow the route markers to the north uphill to the stile by a gate in the fence. Follow the old quarry track (marked) to the disused quarry workings, then continue north-west to the wall (approximately 400m). Join the footpath on the right hand side of the wall and follow this until it descends to a gate on the Garburn Pass track. Follow the track to Checkpoint 3. On leaving the checkpoint, continue to follow the Garburn Pass track, round a right hand bend, through a gate and then down in to Kentmere. Keep following the track as it turns to a tarmac road at the first houses, to the church and village hall where you will find Checkpoint 4 (toilets, food and water stop). 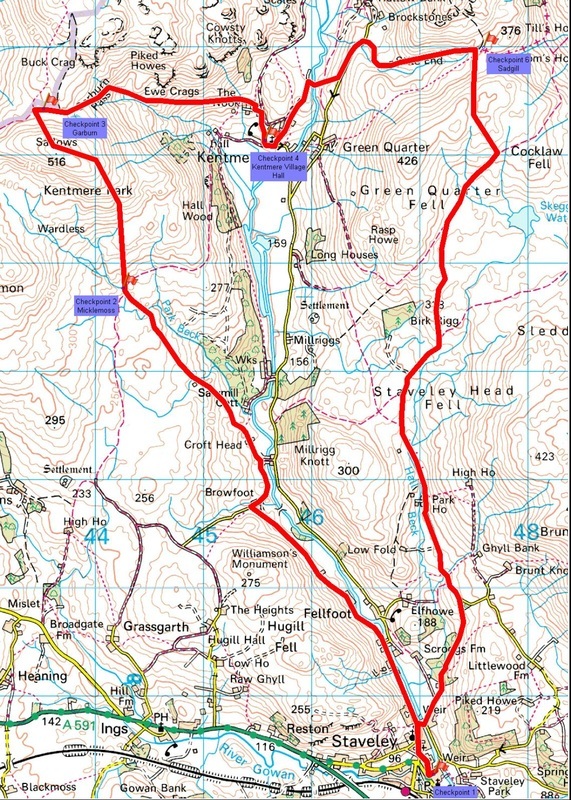 On leaving the checkpoint cross the road and take the public footpath marked “Kentmere Reservoir 3 miles”. After approximately 100 yards turn right through the wicket gate and turn left onto tarmac. Follow on, go through the gate immediately after Brow Head . Follow the footpath arrows, enter the walled footpath and go over the small stile, cross the wooden bridge and bear left. Carry on, go over a stile, cross the bridleway, go over the next stile and follow the path up to the stile onto the road. Turn left and follow the road until you come to the bridleway for Sadgill Pass. Turn right and follow the track uphill to Checkpoint 6. Turn right (south) and follow the wall up to Cocklaw Fell. On descent, cross a stile over a fence to meet the main path. Go right through the gate, following the track (boggy in places) across Green Quarter Fell. At the ruined barn keep left on the path to the gate in the wall corner at Birk Rigg. After going through the gate follow the path along and then down to a big gate and track leading to Park House and a tarmac road. Follow the lane all the way down to Barley Bridge. Retrace your steps from earlier in the day back to the finish in the Mill Yard.